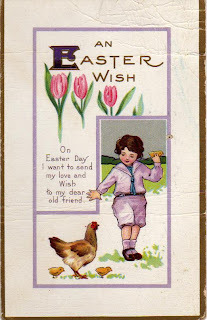 I'm having lots of fun today going through a big stack of vintage Easter ephemera. 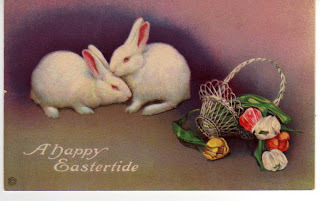 As well as Easter cards, I have some really beautiful postcards, most dated 1910s to 1920s. The illustrations are so lovely that I wanted to share them here. 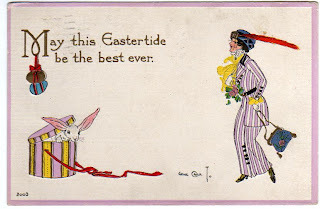 My favorite is the top card -- Art Deco illustration of a woman and a bunny rabbit peeking out a hat box. The woman reminds me a bit of the Vera Neville illustrations of Betsy from the Betsy-Tacy series of books. 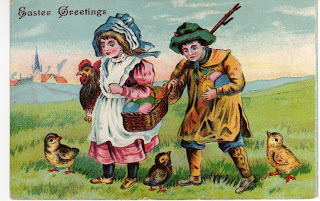 (The illustrator here is Gene Carr, and this is a hard to find card.) These will all be online in my store by later this evening.